Let’s start like this: It’s easier than you might think! The instructions on the wiki may have confused a few of us including me. But after I dug into it, I found out that there is one better way to do this. I’m going to put this in THE simplest way possible. CAUTION: Please apply all the instructions carefully, and do it at your own risk. CAUTION 2: Make sure to have a backup of your files because everything will be deleted from your device. – Make sure to have your contacts synced with your Google account on your Nexus 5, and possibly have a cloud backup of everything that is stored on your phone because I repeat, this will wipe everything out of your phone. CAUTION 3: This instruction is only written for Windows® users. Linux and Mac users, please let me know if you also want a tutorial. Also: Having Sailfish OS ROM on your phone means installing a brand new OS which is NOT Android by any means and will not (yet) support any Android application. You do have dual-boot capability with other operating systems like Android or Ubuntu Touch. But basically if you’re willing to install Sailfish OS (Alpha 3 stage at this moment) on your Nexus 5, it should be for testing purposes OR if you’re a developer, you can help the community to complete this build of Sailfish OS with everything working flawlessly. Open the Settings application and navigate to Security. Locate the Unknown sources option. If Unknown sources is already checked, you can skip this step. using your web browser or scan the QR code. Tap Install to start the installation. Once it’s finished, tap Open to run the app. Download the CyanogenMod Installer for Windows Vista/7/8. Step 2: Install Sailfish OS! This may get a bit tricky for some, but stay with me! Note: I will update the post as soon as a new release was out. – Turn off the phone. – Press volume down and power buttons at the same time. – The boot loader mode will be displayed. – From there choose “recovery” by pressing the volume down button and you are done. Choose “SailfishOS” as ROM type. leave install location as is. Tap Next. 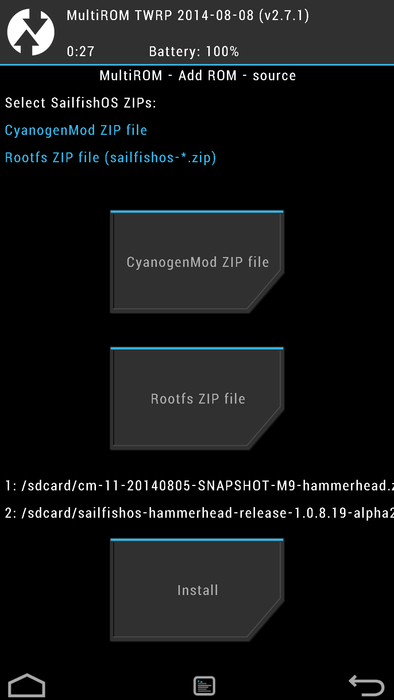 Choose first CyanogenMod ZIP and then SailfishOS ZIP. Tap install. Believe it or not, despite a little trickiness, you’re done! Just wait for the OS to extract itself into your device’s memory and start using it. And trust me, this was the easiest way possible, at least from my perspective. Know an easier way? Hit it in the comment section! Do I need an unlocked bootloader? No, CyanogenMod installer will take care of that! Do I need a rooted phone? No! 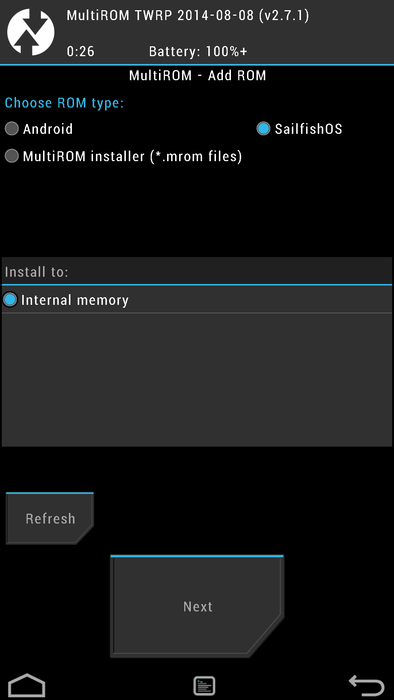 Let CyanogenMod installer do it for you without you noticinig anything! What if I’m already on CyanogenMod? Then make sure it’s the latest version and carry on from Step 2! Other questions? Please feel free to ask. Note: I know I have said it a thousand times but please note that this post is only related to LG Google Nexus 5 Not any other phone. A very special thanks to Martin Brook and Carsten Munk for providing the information and helping me along and more importantly, making the whole thing happen in the first place. Please feel free to ask any question you have regarding Sailfish OS on Nexus 5 in the comment section. What Is Jolla Mobile / Jolla OS? I just have a small issue, when I use sailfish the data connection for the mobile won’t connect and the wifi won’t get remembered so is kind of a problem each time I want to navigate have to type the wifi password. Yeah the WiFi issue is a big one that should be fixed soon. But I have 4G and 3G data connection on my nexus when running Sailfish. Maybe you should go to settings -> system -> mobile network -> and edit your internet settings by holding down your finger on the mobile data connection. I have installed Android on my laptop with the x86 iso. Do you have the link to a x86 version. I have a nexus 5, but I already have multirom. I have 5.0.1 lollipop as internal, and cyanogenmod11 as secondary, and also Ubuntu touch. When I press add ROM, do I select cyanogenmod zip as well or just the sailfish one? New release IS out. There’s an alpha4 now. Thanks for the update! I’ll make a new post as soon as possible! How to install sailfish os on samsung Galaxy s3 GT I9300. Sorry, tried it your way. Menu in recovery mode didnt show. hmpf. what went wrong? P.S. Cyangenmod-installer didnt work either cause firmware of my nexus 5 wasnt good enough… why? Hi there, I have great interest about Sailfish OS, could I just use this way to install Sailfish OS on my Nexus 7 2013? I`m Chinese, with the Great Fire Wall I could not find some important info about this. Thanks! No this is only for Nexus 5 unfortunately. I don’t have any good and easy tutorial regarding the Nexus 7 for you sorry, but I know it is possible. Thanks for this Sepehr, do you have a tutorial or tips for doing this on Mac OS X? It’s about time to update the links for latest image. Dude this is amazing when I figured out that a Persian guy is working on Jolla !! Jolla has a long way to get success, keep going! I’m using Jolla Alpha11,higher version?? Keep this post up to date please! Haha you’re welcome! I’m not officially employed by them but yeah I would love to be an employee one day! Soon this post will be updated with newer links! I didnt get the screen for installation after I went in to the recovery mode. Is it working on your device? I am using same device, and its not working for me. Wonderful work done by you, will try this. can you please update your tutorial….on how to install jolla 2.0 with and witout dual boot on nexus 5 hammerhead………….pretty please…..
Hey, im using motoG 1st gen. Im planning to buy another phone(probably a jolla) and also keep motoG, but instead of having android on it, can i completely remove android from the device and install sailfish alone. I don’t mind if my GSM functionality doesn’t works,.. i would like to use it more like a in hand PC. Just installed Sailfish according to above tutorial. booted into sailfish OS and now only i m able to see is Google boot logo as i’m using Nexus 5. Now what should do to make it work? Does it works with the stock nexus rom o cm is a must? How can I install Sailfish on an IPhone 6? Is that possible? Any way to do it? I have been looking for an answer to that for many months. I would appreciate if someone could explain to me how to do it. multirom in my nexus 5 what i will do? multirom not working in my nexus5 & when i was tried to boot no comman is showing what i will do? Hello, what version of Cyanogen should I install? Can it be latest, today it is 13.0 from 20th August 2016, or it should be 11.0, as it is in Mer wiki? I have an LG Nexus 5 (international version). The CM and SFOS that work in the device is https://download.cyanogenmod.org/get/jenkins/86435/cm-11-20141008-SNAPSHOT-M11-hammerhead.zip // http://images.devaamo.fi/sfe/hammerhead/beta0/sailfishos-hammerhead-release-1.1.9.28-beta0-201510022255.zip. But cannot install “android” applications, .apk files. The “File manager” application shows a message stating “xdg-open” “cannot install” messages. The “Android support” application is not found in “Jolla store”. Any idea how we can solve? Is this tutorial only work for nexus ? Hi! Sepehr James Noori here! A geek living in Sweden. Maemo/MeeGo/Mer/Harmattan/Sailfish & Jolla enthusiast who is keen to share knowledge with friends. Proud N900, N9 and Jolla owner! Hope you guys enjoy my writing. Would you buy and use next Jolla phone? Jolla Ltd. is an independent company, continuing Nokia’s excellent work on MeeGo based smart phones together with the people who worked on N9 development, and us being N9 and MeeGo fanatics just couldn’t resist not to support Jolla and their efforts to popularize Sailfish OS. JollaUsers is a blog for spreading Jolla Love all over the world in which you can find news, reviews, interviews, rumors, etc.